1. 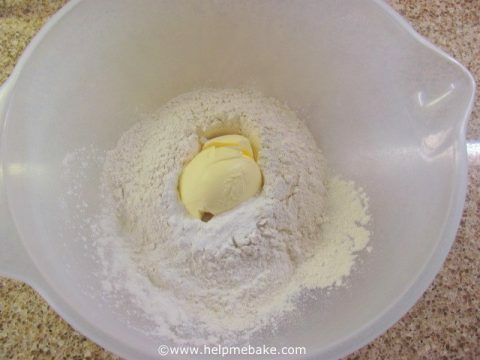 Place the self raising flour, baking powder and margarine into a mixing bowl. 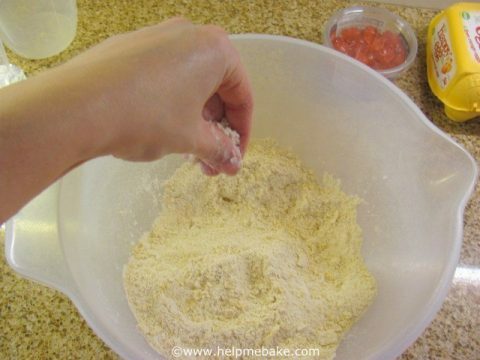 Rub the butter into the flour mix using your fingertips. (Like you’re sprinkling salt with your fingertips). 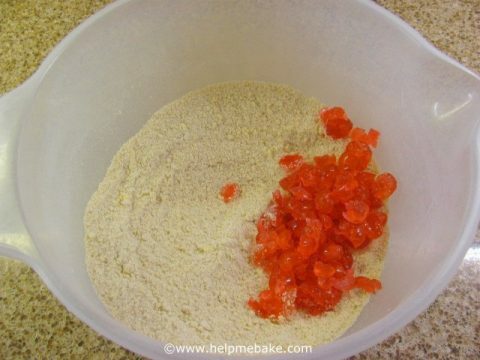 Do this until the mix resembles bread crumbs. 2. 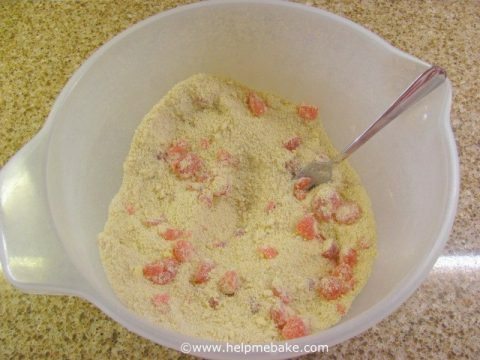 Now place the sugar into the mixing bowl, stir it into the breadcrumb mixture with a fork (it divides the sugar up and mixes better). 3. 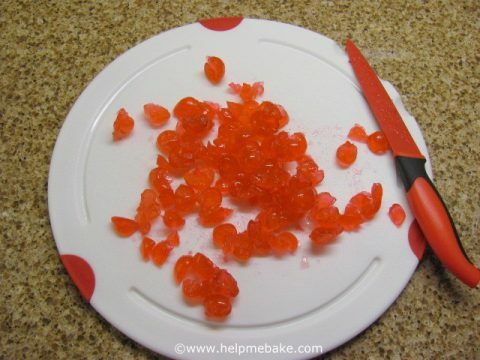 Chop up the Glace Cherries into quarters or halves (depending how big you want them) then stir into the mixture with the fork. Place to one side. 4. 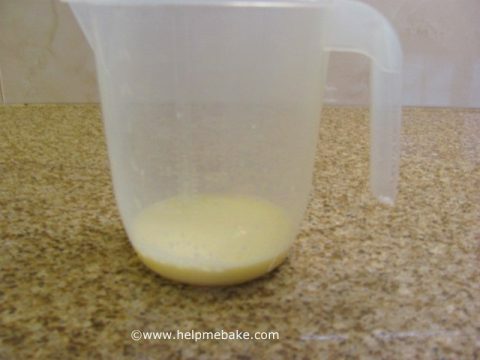 Place the ¼ Pint of Milk (I used semi skimmed) into a jug, crack the egg into a small bowl then pour into the jug of milk (this ensures no eggshell ends up in the milk). 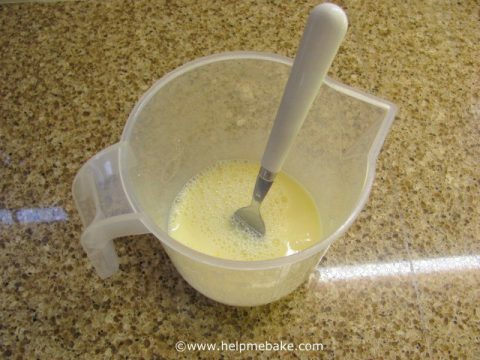 Stir together with a fork ensuring the egg beats well and combines with the milk. 5. 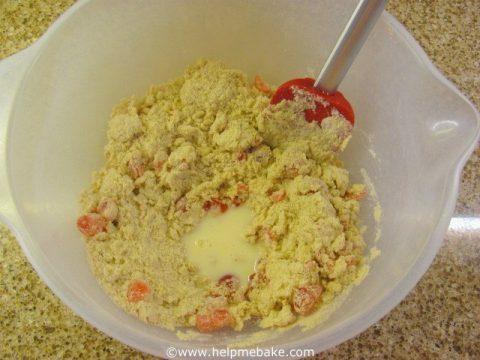 Now add small amounts of the milk/egg mix to the dry scone mixture in STAGES. 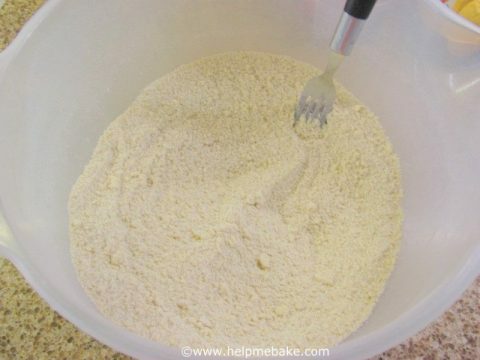 Bind together with a wooden spoon/spatula, do this until all the dry ingredients have been absorbed. 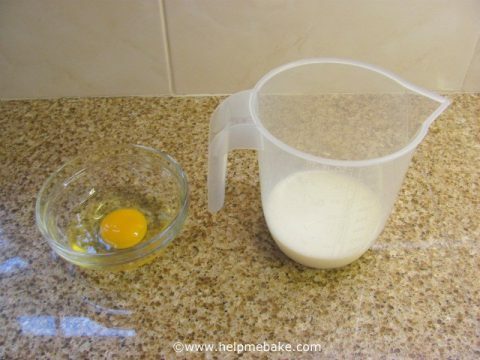 You should have around about a third/quarter of the milk/egg mix left in the jug. 6. 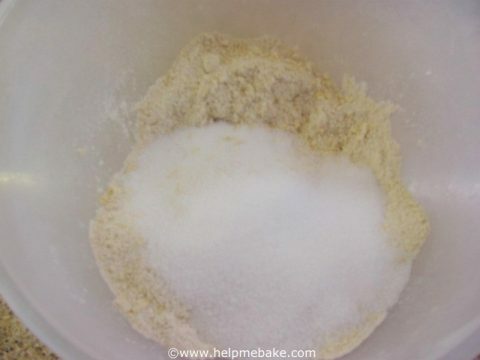 Now lightly flour a work surface and your hands, turn out the mix onto the flour, flip the mix over with your floured hands, and rotate it round in a circular motion. 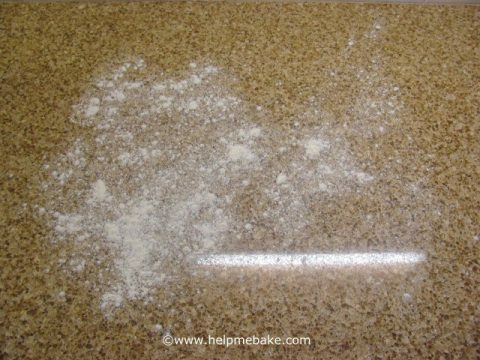 Use a lightly floured rolling pin to roll over the mixture until it’s about one inch thick. 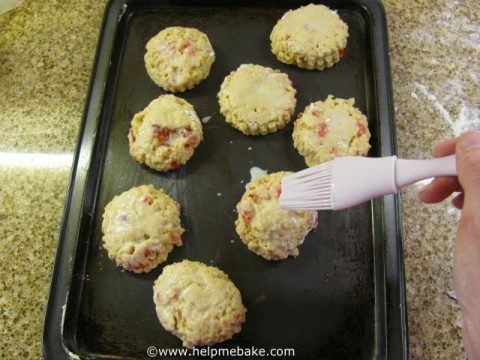 Cut out your scones using round cutters. 7. 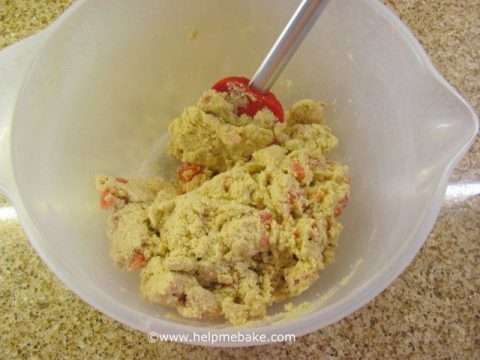 Place them on a greased baking tray leaving spaces between them (they spread and rise when baking), glaze only the top of your scones with your remaining milk/egg mix using a pastry brush. 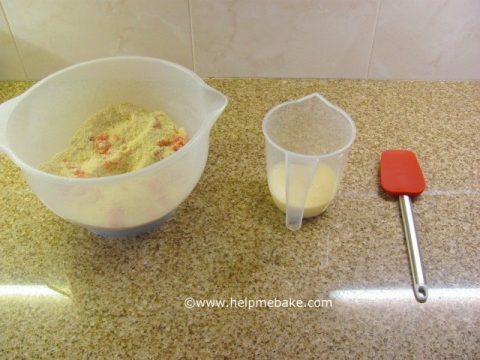 Careful not to let the milk/egg mix run down the side of the scones as this prevents the scones from rising fully. 8. 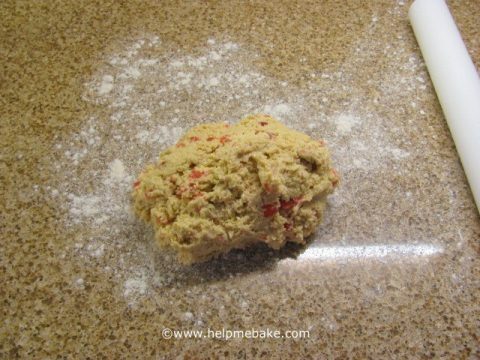 Bake in the middle of the oven for 10-12 mins, this will make around 6-8 big scones. 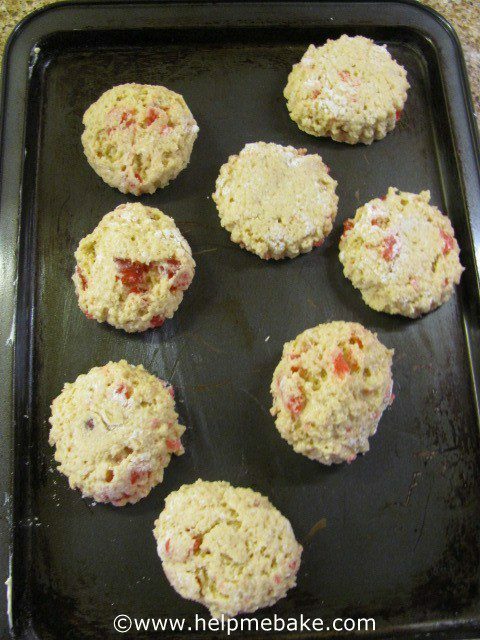 For smaller scones roll the mix thinner. 9. 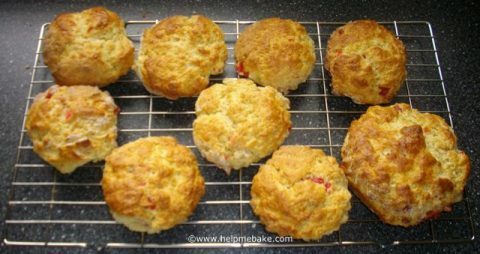 Test your scones with a skewer or toothpick, if they come out clean they are done, if there is mixture on the pick then bake for a few minutes more. 10. Allow to cool fully on a wire rack. 11. 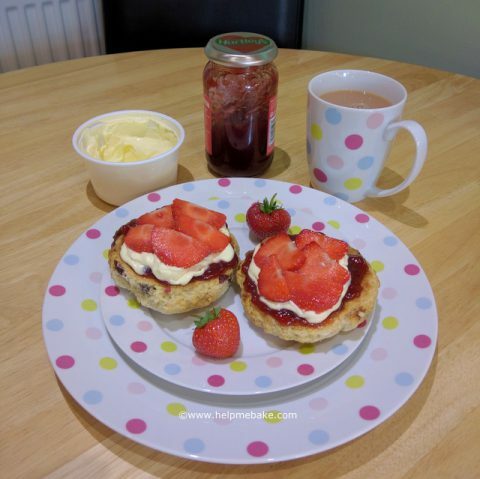 Once cooled cover in jam, clotted cream, strawberries and enjoy with a pot of tea!